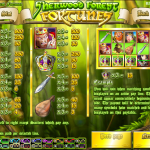 Sherwood Forest is a 5 reel / 20 paylines slot game developed by Rival. It is pretty obvious that this game is about Robin Hood and the atmosphere is very medieval. The background is very green which makes sense because it is set in sherwood forest after all. Also, all of the famous characters you know from the Robin Hood tales are here too. 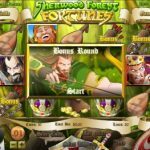 The Wild in this game is the Robin Hood symbol which will substitute other symbol to create a winning combination. It will appear on reels 1, 3 & 5 and could stack up on top of each other. There are also two scatters here. The first one is the Maid Marion symbol. 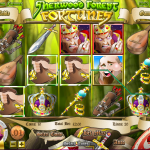 Landing 3, 4 or 5 anywhere on the reels will reward you with 5, 10 or 20 Free Spins respectively. The multiplier for those wins is 3x with a chance to re-trigger the Free Spins when landing more scatters. The second scatter is the Quiver symbol and landing 3 or more will trigger the Bonus Round. Here you’ll be playing a short mini game after which the game will more to a different section. Of course, each time you’ll be playing the bonus game you’ll win a nice prize. This is yet another very polished game by Rival. They sure know how to design engaging 5 reels games when they want to and we think you will really enjoy this one too. If you’re a rock and music fan then you should consider playing Rock On a 5 reel slot by Rival.